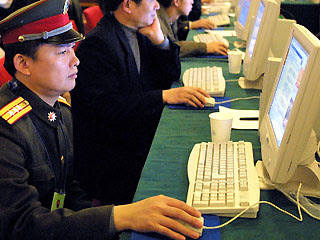 A new regulation by China’s People Liberation Army (PLA) bans China’s approximately 2.5 million soldiers (the vast majority of which are male) from online dating (including advertising for wives), social networking or blogging. So what’s a lonely soldier in the 21st century in China to do? Well, go to bi-monthly dating socials, apparently, where they can meet “reliable civilians”. On the other side of the coin, PLA soldiers are also some of the most sought after husbands in China for a number of reasons, including financial stability, high social status, and well, because they’re tall (there is a height requirement), so all those well off, respected and tall soldiers just got a little harder for China’s women to get to know. Don’t feel too bad for the women, however – there are approximately 30 million more men in China than women. On a more serious note though, the solider quoted in the China Daily also had this to say about not having full access to the Internet: “We are not familiar with current affairs or popular social topics, which makes it hard for many demobilized soldiers to blend into society,” which must certainly be true as a solider in the world’s largest army, in a country with the world’s largest online population.